The Conch: the sound of the dharma or spiritual teachings, which awaken us from the deep slumber of ignorance. The Eternal knot: the interdependence and interconnectedness of all things. The Fish: the happiness that accompanies freedom of movement and the letting go into the flow of the waters of life. The Lotus: the initial state of primordial purity of the mind. The Parasol: protection from all forms of negativity and all types of hindrances that may arise towards our practice. The Urn: health, longevity, prosperity, and wisdom. Blessings. And to receive, one´s urn must be empty...of all type of attachments, mainly self-clinging and self-importance. 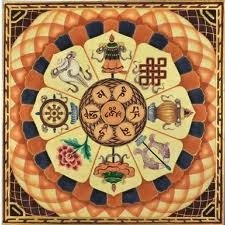 The Wheel: the turning of the "wheel of the dharma." Dharma in action. Spiritual practice. And any kind of positive act, something that brings joy instead of suffering to another can be a form of spiritual practice. The Victory Banner: victory over delusion. Enlightenment...a casting of light upon all that may be obscured by illusion and ignorance. Blessed New Year. May love and consciousness increase each day to infinity.